Wicca: the Modern or Older Witchcraft? Wicca and Witchcraft: which is what? Modern Wiccan practice was first popularized by Gerald Gardner in the 1940s. Gardner was a British occultist who fused hereditary witchcraft with rituals from the Rosicrucians, Freemasons and Eastern philosophical traditions. They are required to be true to their well-known Rede: "An' ye harm none, do what ye will." The term witchcraft is a broader and somehow different religion, or way of life. Actually, many witches do not use the word religion, which implies strictures, rules and exclusivities. The Craft needs no church or leader, and covens are not actively seeking new recruits. It seems anyone is welcome to practice the craft. And both employ rich symbolisms. Gardnerian witchcraft on the other hand can possess certain defined ceremonies and rituals. It has certain traditions or families that one can actively join. Followers may also have their proprietary deities, prayers and rituals, while witchcraft may choose to honor any particular deity or just the God and the Goddess, or the Lord and the Lady, as symbolic of the powerful balance vital to the well-being of nature and all creation. Many witchcraft practitioners do not mind being called otherwise, while some gently assert that they are good-old, garden-variety witches of the Old Religion, or the Craft of the Wise. Like Taoism, witchcraft never evolved into (or perhaps was never meant to be) an organized, official religion, although both have principles that define a sacred way of life. One thing certain about witchcraft is that it acknowledges both the God and the Goddess, who are present in each creation, man, woman, plant and creature. Witchcraft: What's in a Name? I used to be really confused why there should be distinction between Gardnerian witchcraft as well as its modern religions and the more ancient and basic witchcraft practice. The two practices are hopelessly entangled. The word wicca has probably been in use for hundreds of years before Christianity. Nonetheless, I perceive somehow that the magical line between these two crafts is slowly vanishing. Perhaps we can all agree that both are a beautiful, spiritual, eco-friendly way of life! Check out the lovely celebrations of Witchcraft here! You can also read more on Witches, Witchcraft and Witchcraft Traditions if you haven't already done so. OR you can return from Wicca (this page) to the main Witchcraft Symbols page. Want to know see more symbols and symbolisms? Go to the Symbolisms homepage. 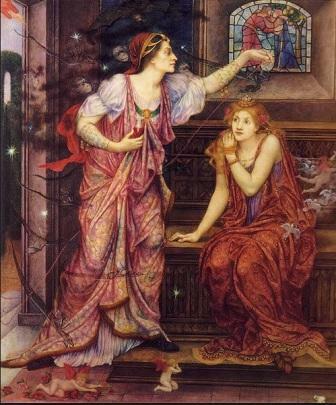 *Painting by Pre-Raphaelite Brotherhood artist Evelyn de Morgan.